Until yesterday, it had been almost three months since the last burning skyscraper in the United Arab Emirates. That all changed when a building went up in flames on Monday just outside of Dubai. Several residential high-rises were evacuated by fire in Ajman, a city in Dubai’s metropolitan area. 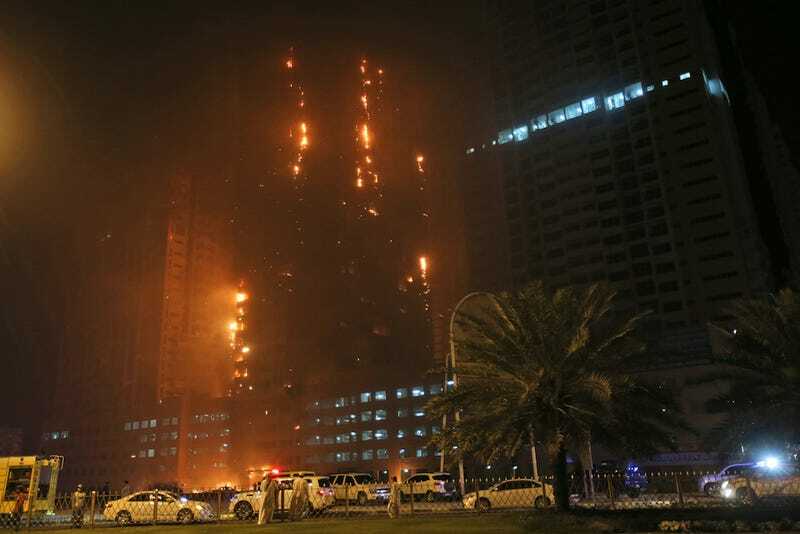 According to the Gulf News, the Ajman One complex consists of 12 towers, one of which was badly damaged. No casualties have been reported, and the fire appears to be out. For those keeping track at home, this is the fifth skyscraper fire in the Dubai region since 2012. And the cause of this fire is likely the same as all those other fires: An insulating building material called aluminum composite panels (ACPs), which is found in two-thirds of the buildings citywide. It has since been outlawed, and existing buildings with the material have been required to add additional sprinklers and other safety features. But not all have complied. After the last fire—which raged as a New Year’s Eve fireworks display proceeded as planned in the same complex—I asked when Dubai might assume some responsibility for the safety of its citizens. It’s apparent now that burning skyscrapers are just something that residents of the United Arab Emirates should simply come to expect as part of daily life.